Kansas leapfrogged the Zags last week when it clinched another Big 12 title, but the Jayhawks returned the favor this week. Gonzaga (28-4) moved up to No. 6 while the Jayhawks slid from sixth to ninth after losing to Oklahoma State. Gonzaga held off a charge by Michigan, which soared from No. 15 to No. 7 after winning the Big Ten Tournament. The Zags earned 1,254 points, an increase of 23 from a week ago, and Michigan collected 1,231 points. Virginia strengthened its hold on No. 1 by garnering all 65 first-place votes. Villanova took over second, followed by Big East rival Xavier and Michigan State, which lost to Michigan. No. 5 Duke stayed put by bouncing back from a loss to Virginia Tech with a victory over then-No. 9 North Carolina. Fifteen teams in the Top 25 lost last week, which helped Saint Mary’s jump two spots to No. 20. 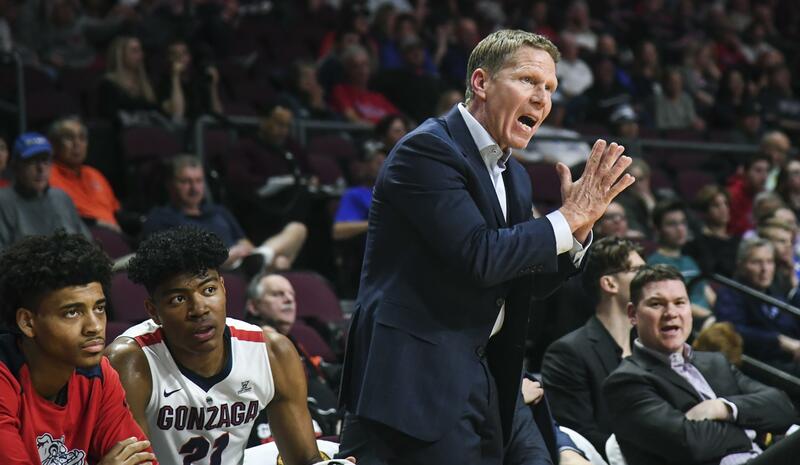 The Zags appear to be in a holding pattern in most NCAA Tournament projections. They are generally attached to the five-seed line while the Gaels are often an eight or nine. ESPN.com, CBSsports.com and Foxsports.com list Gonzaga as a five seed. ESPN.com has the Zags facing No. 12 New Mexico State in San Diego. CBSsports.com has GU taking on Loyola of Chicago in Boise. Gonzaga is the second highest fifth seed, just behind Clemson, in CBSsports.com’s team ratings. Kentucky and Ohio State complete the five-seed line. Their fourth seeds, in order, are West Virginia, Wichita State, Michigan and Arizona. Gonzaga also moved up one position to No. 6 in the USA Today poll. Virginia was a unanimous No. 1, followed by Xavier, Villanova, Duke and Michigan State. The Zags trail the Spartans by three points. No. 7 Michigan is 11 points behind GU. Gonzaga’s RPI remains fairly steady at No. 29 through Sunday’s games. Saint Mary’s is No. 36, BYU No. 80. Published: March 5, 2018, 10:06 a.m. Updated: March 5, 2018, 11:23 p.m.